I continue to be impressed with the Nokia E73 Mode. I especially like the form factor, keyboard and quality construction. The E73 is a variant of the E72 made for and branded by T-Mobile USA. It comes with support for the operator’s unusual 1700/2100 3G frequencies and also has a rather nice feature which T-Mobile calls “WiFi Calling” or “Unlicensed Mobile Access” (UMA) which lets you make and receive calls and texts using WiFi. UMA is not the same as SIP or VOIP, calls and messages made with UMA are charged against your included plan minutes, text bundle or prepaid balance. Where UMA is most useful is in keeping you connected connected when you are in an area with poor or no cellular service. While UMA is a good thing it does require some extra setup steps if you want to be able to use WiFi data for browsing and with data aware apps. The setup is not complicated but it does not seem to be very well documented and the out of the phone’s out of box default settings are not optimal. Connecting to WiFi frequently failed with “﻿﻿J007 Error, “Incorrect Security Certificate”, which is a UMA error message. The browser and other apps didn’t automatically use WiFi when it was available. I had to manually change the phone or app’s connection settings to use WiFi and then change them back to use mobile network data. I got a different UMA error, “W006.1 ISP error”﻿ when tying to connect to public hotspots that redirect you to a web page to sign in or accept term and connections. It took a couple of days but I was eventually able to find solutions or work arounds to most of these issues. Getting rid of the “﻿﻿J007 Error, “Incorrect Security Certificate” was easy. All I had to do was upgrade to the latest latest firmware (currently 0.43.001). Getting the E73 to automatically switch to WiFi for data should also have been easy thanks to Symbian 3rd Ed, FP2’s new “Destinations” feature. A Destination is a group on cellular and WiFi access points arranged by priority order. When the browser or another app attempts to connect it goes through the access points of the default Destination in priority order until it finds one that is active. On most 3rd ed, FP2 phones there is a default “Internet” destination that initially contains your only operator’s packet data access point. When you connect to a WiFi HotSpot, the phone automatically adds that access point to the Internet destination and sets its priority higher than the operator access point. That way the phone will use WiFi if a previously used hotspot is available and fall back to operator data if it isn’t. But the E73 oesn’t work that way. The Internet destination contains the T-Mobile packet data access point as expected, but WiFi access points get automatically added to a “GAN” destination. 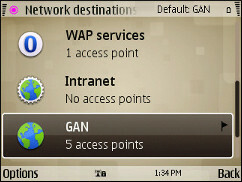 GAN (Generic Access Network) is synonymous for UMA. Because the WiFi and operator access points are in different destinations apps can’t switch automatically between them. Fixing that was a little tricky . The first thing I tried was adding my frequently used WiFi access points to the Internet destination. That seemed to work at first but as soon as I moved out of range of WiFi the phone became very sluggish. I could make calls but was unable to switch to or kill any running apps. When I did a long press on the Home key I saw a mysterious system process called ShareCommServer running that I couldn’t kill either. The only way I could recover was to power cycle the phone. Through trial and error I figured out that if any app tried to make a connection outside of WiFi range the phone would hang. Apparently the apps were trying to use the non existent WiFi connection and the OS was blocking on the connection request! Press Options – > Default connection and choose “GAN“. The phone will automatically connect to WiFi access points in the GAN destination if they are in range. Back on the Destinations main page, click “Access Point Add new acc. 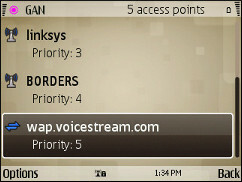 pt.” Say No to the prompt to automatically search for new access points. Choose “Packet data” and enter “epc.tmobile.com” as the access point name (prepaid customers may want you use “wap.voicestream.com” instead to get free access to a small walled garden of off-portal mobile sites). In the Nokia browser menu, open Settings Menu -> General and set the access Point to GAN. Leave all your Java apps Access Point’s set to the default of “None” in the App Manager . This tells them to use the default Destination. Nokia Mail is not destination aware and its step up is a bit tricky. Go into Nokia Mail’s Options menu -> Settings -> Mailbox Settings -> Advanced mailb. settings -> Incoming email settings and set “Access point in use” to the T-Mobile access point or “Always ask” . Do the same thing for the Outgoing email settings. “W006.1 ISP error” was the hardest nut to crack. This error occurs when you try to use a public WiFi access point at a cafe, store, university or library that requires you to open a browser and log in or accept terms and conditions. Trying to connect to this type of hotspot using the WiFi widget on the E73’s idle screen will always fail. It looks like the phone is trying to talk to T-Mobile’s UMA server before it allows a connection to be finalized. Fixing this will probably require another firmware upgrade but I was able to find a workaround. When you get a “W006.1 ISP error” (image above, left), open the browser. Try to open any bookmark or URL The browser will prompt you for an access point. 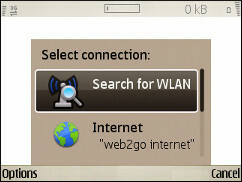 Choose “Search for WAN” (image above, right), select the name of the hotspot and press OK. The hotspot’s login or T&C page will load. Follow the instructions on the page to connect (image below, right). 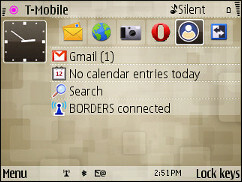 Go to the phone’s home screen and click the WiFi widget. Select the hotspot name from the list of available connections and press OK to connect. This will establish a UMA connection and add the hotspot to the GAN destination where other apps can use it. 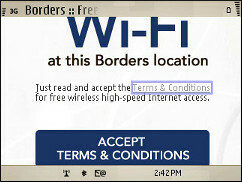 The image below, right shows that the “Borders” hotspot is connected. The pink icon in the top, left corner of the screen indicates that GMA is active. If you found this post helpful, have questions or have discovered other E73 connection tricks please leave a comment. This entry was posted in WiFI and tagged E73Mode, Nokia, T-Mobile, UMA by Dennis Bournique. Bookmark the permalink. K about the sharecommserver.exe, how do you get rid of it or atleast prevent it from accessing the internet without notification? I don’t think’s possible to remove sharecommserver.exe. You can prevent it from causing problems by following the instructions in the post to copy your mobile APN to the GAN destination and set GAN as the phone’s default destination. the sharecommserver.exe is part of facebook pro which is pre-programmed to see new updates every 6 hours. I found your article quite helpful, i have something to ask though, can i connect to yahoo messenger using wifi connection?i dont want to spend my prepaid credit on that. You need to use a mobile Java IM app like Nimbuzz, eBuddy, WeBuzz, Papaya or Nefanasa which should work over Wi-Fi. I get to the part where it says: “In the Nokia browser menu, open Settings Menu -> General and set the access Point to GAN. In Gravity set the default access point to the T-Mobile access point and enable “Auto-Switch to LAN” and have trouble finding the Nokia Browser menu and the Gravity you mention. further keystroke help? For the Nokia browser menu, open the browser, press the left soft key, then scroll down to and click Settings and then click General and then click Access point. Gravity is a popular paid Twitter client. If you don’t use Gravity ignore the references to it in the post. interesting…. 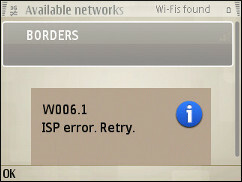 I’d never seen the W006.1 ISP error until I tried the above, I was trying to solve my UMA connection problem. I now also get the “share” app showing up, with the phone being sluggish. I got as far as getting online with the browser, but I’m getting the J007 error when connecting to my local WiFi, and can’t seem to upgrade to the latest version through the OVI software–keep getting erros when trying to update. Where can I find the latest Firmware version? 1. From the Home screen, press the Menu key. I need your help, I purchase the E73 on ebay, it came block for T-Mobile so I proceed to unlock it and the phone works perfect but I am still having the problems connecting to WIFI. I did what you say to upgrade the Software to verion 043.001 and the custome version is in 043.001.200.01 I even perform a system reset to see if the problems gets solved, but nothing. I hope you can help me with this problem because I purchased two phones, one for my wife and other for me and her phone is a Christmas gift and I want to have it working perfect because she uses her phone for work and WIFI is a necessary tool for her. I don’t have the E73 anymore, it was a review unit and went back to Nokia months ago so I can’t really troubleshoot connection issues with it anymore. However I was able to resolve almost all of the WiFi connection issues using the combination of firmware 043.001 together with the destinations tweeks and other technique described in the post above. There were one or two WiFi access points I was unable to connect to. If you are still having problems try a different WiFi access point if possible. If you are a T-Mobile customer open a ticket with their customer support. No idea. The real E73 from Nokia doesn’t support dual SIMs. Yours is a fake. Possibly either the phone or the second SIM is defective or maybe there is a setting that you have to change to be able to switch between SIMs. I use the e73 on prepaid for the current time. I will probably get a flex pay account when I burn through my prepaid minutes. To avoid the “you have insufficient data plan rights. Do you want to upgrade? (yes/no)” message. Do the following. My phone was also unlocked and don’t know if this affects anything. T-Mobile was nice enough to unlock the phone while on a prepaid account. I told the representative what kind of the phone it was and she that was not a problem. Then make sure all apps are pointing at “internet” destinations. When using the browser make sure you hit t-zones first. That should take care of that error message. Thanks for the excellent posts. I just got my E73 and I am getting the famous w0006.1 ISP error. I followed the directions for the fix but I am still having the same issue. The one step in the directions that I didn’t follow is where it says (In Gravity set the default access point to the T-Mobile access point and enable “Auto-Switch to LAN”) I don’t know what Gravity is on the phone, is this an application? Does it come pre installed? I havn’t found any application named gravity in the last couple of days going over and over the menu’s trying to get this UMA thing to stop rejecting. Please if anybody can help, I would so appreciate it. I am overseas in Afghanistan, and UMA is how I talk to my family, except since my 6301 broke and I got my E73, I have not been able to talk to them. Try going into the GAN destination and deleting the WiFi hotspot that’s giving the error. (If you are within range of that Hotspot you may have to go into offline mode to be able to delete it) Then go to the browser and and try to open any bookmark. You should get redirected to the hotspot’s login or accept terms page. Do whatever you need to do to use that hotspot. Within a minute or two the UMA icon should show up in the top left corner of the screen. If it doesn’t appear within two minutes click the WiFi widget on the phone’s idle screen and try to connect to the hotspot from there. Well the thing is, I only have one T-Mobile router where I am right now. Although the phone has four different items to choose in GAN, I don’t know which one is giving the error. Should I just delete all of them, and then ADD my router and all the settings back in as the only one? I’m surprised that you are problems with your own router. Do you have the latest 0.43.001 firmware? Once I updated the firmware I only had trouble with public hotspots that required using the browser to authenticate or accept terms and conditions before you could use the connection. I don’t have the E73 anymore but there are a couple of items in the GAN section that you shouldn’t and probably can’t delete. One is @Home and I think the other has GAN_ in the name. They are the first two entries. To be on the safe side just find your router’s name using the WiFi Wizard’s search for Hotspot function and then go into the destinations and delete it everywhere it appears. It probably will only be in the GAN section. I’m currently using my E73 on Tmo prepaid. just started getting a message about “you have insufficient data plan rights. Do you want to upgrade? (yes/no)” — first of all, I’m not sure if this is a Tmo message or a message from the phone. I did some googling around and couldn’t find the same message. Have you heard of this? For example, in the Setup -> Ctrl. Panel -> Settings -> Connection -> Destinations area, do you still have listing for “Packet Data” now that you have moved Packet Data to Gan? Maybe it should have been deleted. And even if it’s still there, I’m thinking it should that be be pointing the wap.Voicestream server to match how I set it up in the GAN area (right now it points to the EPC server). What about the other destinations, like Multimedia Messaging (Web2Go MMS) or the WAP Services (Web2Go phone book) – should these still be there and if so, should they now point to the wap.voicestream servers or remain on EPC? Cheers and thanks for the great site. I don’t really have any answers to your questions but I can confirm that my experiences using the E73 on prepaid seem similar to yours. – I have a “Packet Data” entry to but it’s in Setup -> Ctrl. Panel -> Settings -> Connection rather than in Destinations. It has epc.tmobile.com as the access point. I haven’t tried changing that. I think it’s only used for tethering. – You shouldn’t need to change the MMS settings as they are normally the same for prepaid and postpaid. – I haven’t touched Wap Services either. I have to send the E73 review unit back tomorrow so I probably won’t be able to do any more experimentation with it unfortunately. Thanks Dennis. That does help. I’ll mess around with the settings and see how it goes. Again, I’ll be switching to post-paid here eventually so maybe it won’t matter. As for returning your review unit — you’d think they’d let you keep it. I can’t imagine how many phones you’ve helped sell with these posts! Agreed. The whole destination thing has been driving me nuts. Much appreciated! This was awesome! Thanks SO MUCH!!! These same issues were driving me nuts with my new E73. It’s obvious you put a lot of time and thought into the fix.